In this informative article we are going to look at 4 ways to stay productive while traveling for the holidays. This way, you can enjoy the best of both worlds. 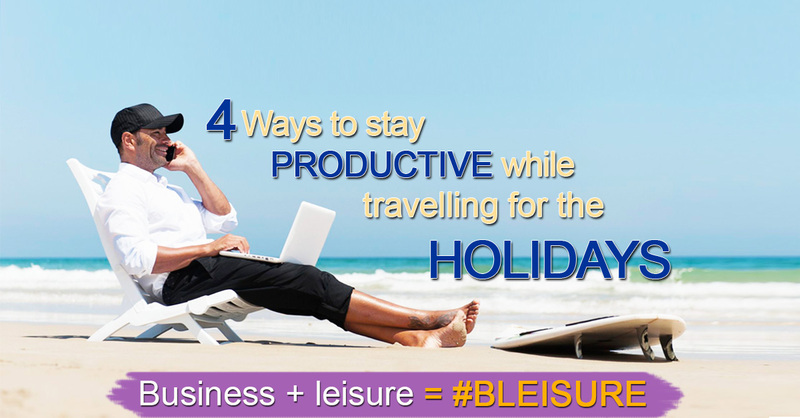 Business + leisure AKA bleisure. The last thing we want for you when you come on holiday is to be bogged down with work, but if you follow these quick and easy tips you will be able to achieve a perfect balance between work and play. Your productivity on the road really begins before you ever get there. You’ve probably been in an airport and walked by a terminal to see a crowd of people huddled on the ground… next to the outlets, of course. If you hope to get things done while you’re traveling, plan now with a few fabulous gadgets to keep you connected and hustling. Some item we would recommend would be a good power bank, noise cancelling headphones and a fully charged cell phone and laptop. E-mails can take over your life while you’re traveling or on holiday. Whether you’re at the family’s house not paying attention to anyone because you’re “trying to get through messages” that piled up while traveling, or your phone is constantly going off, you can combat a lot of this by being strategic with your inbox. Productivity expert and author of Work Simply, Carson Tate, suggests making specific time just for e-mail. While on holiday, “plan an designate specific times to check and respond. For example, you could decide to check e-mail in the morning and once in the evening,” Tate says. Having that schedule will keep you present and yet on the ball. Conklin has another strategy: “I always work on responding to important e-mails and working on things like updating project plans and reviewing documents which don’t require Internet.” You can cue up all the messages you need to get through while in transit and write responses, to be sent when you’re connected again. Hello holiday inbox zero. Often your travel day will seem back to back without realizing you have numerous 15- or 30-minute windows that get wasted waiting for people to board or standing in line at security. By blocking out your calendar on travel days alongside the calls, e-mails or planning you need to get done, you can see what makes the most sense to do and when. Block out your calendar for the entire day, down to the details of riding in a cab, going through security, or sitting on the train. During each block, schedule tasks or the work that needs to get done that makes sense for that time frame. You’ll gain back so much time that way. Not everything needs to get done while you’re traveling. And especially during the holidays – it probably shouldn’t. Rome will always be burning, so learning to prioritize what must happen while you’re gone versus what needs to be done but can wait is imperative. If you’re trying to figure out what stays and what goes, take this tip from Tate: “Ask yourself if the projects and tasks on your list are still relevant, are directly tied to the organization’s strategic goals, and have a significant return on time investment. Then, ask yourself if they provide meaning and joy. As you answer these questions, there are probably a few tasks and projects lurking on your list that need to be removed. No one is going to miss them, especially not you.” Make sure you know exactly what needs to get done while you’re hopping from transportation to place, and make sure you have what you need to accomplish that. Staying productive during holiday travel isn’t always the easiest, but it can make such a difference in allowing you to stay present and engaged when you arrive to your destination. In the end, do whatever will help you stay balanced. We would like to give a shout out and say a special thank you to Coca-Cola Company for this amazing advice, I am sure all of our readers will agree!